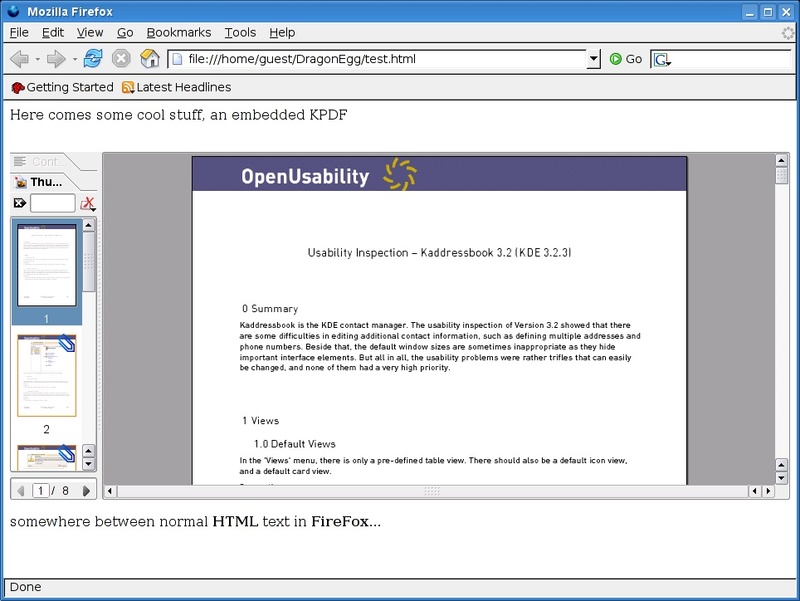 Today the KDE project previewed a new technology that allows arbitrary KPart-based KDE applications to be embedded into Mozilla's FireFox. Thus, KDE applications can soon be used to show rich content such as PDF files using KPDF or display multimedia files with KMPlayer or Kaffeine. "Once again, KParts has proven to be a flexible component technology that makes development easy even when dealing with non-KDE applications", said Tobias König, author of the KPart-Firefox integration. As the code was created on the KDE booth at LinuxTag, it is not yet in the KDE repository. However König, best known as the author of KAddressbook, is planning to check in the code soon. > ... this may be because I am using a version of kpdf which was bundled with fedora core 2 (older version). IIUC Fedora Core 2 came with KDE 3.2. In the meantime KPDF has been greatly improved so I strongly recommend upgrading.